Hello! I'm still here, I promise! I had a major computer crash/blow up issue over the past two days and I couldn't retrieve my images to get this blog post together in time. I'm so sorry for the delay! How would we survive without computers these days?! Anyway... I am back online and today we have a TON of tips and things to show you about starting your raglan increases and adding the stripes to your sweater. Let's get knitting! Our first goal in the "increase" part of the pattern is to change to the larger needles. Have your other needles and stitch markers ready because we're going to do this all in one setup row. Following the stitch counts in the setup row, knit from the first smaller needle on to one of your larger needles. Remember that our first stitch marker sits one stitch in from the actual beginning of the round. For example, the 6 month size says K6 so that includes the first stitch that is currently sitting before the marker. Place the stitch marker on the new needle. It's a good idea to have three stitch markers that are different than your initial marker. My little white sheep are a good visual difference from the blue one at the start. Moving along and around the project, be sure to keep counting and adding markers when necessary. Here we go! Small needles out, larger needles in, stitch markers placed. Let's increase! Knit the first stitch and move the marker. Our instructions say to M1L and this is a left-leaning increase that is also called a bar increase. See the line stretching between the two stitches parallel to my finger? That's our bar! Insert the left needle from the front to the back lifting the bar up and onto the needle. Knit with the righthand needle into the BACK of the stitch. Finish the stitch as a normal knit stitch bringing it up and on to the righthand needle. Then we are to knit to 1 stitch before the next marker. Let's find the bar! Our M1R will be worked the opposite way to make these increases slant the opposite direction. Insert your lefthand needle from back to front into the bar. Knit into the front of this new stitch. This step should feel hard to do but that's ok! If it feels easy then it could make a hole. If it's hard to knit then you will get a nice, snug increase. Keep working around the needles as instructed and don't forget to increase before the last stitch, too! (I did and I had to rip back.) Then we knit the next round. Continue increasing ever other round. Eventually your double-pointed needles will begin to fill up. That means it's time to change to your size 8 circulars! I like to move to circulars when my stitch count gets to between 70-80 stitches. I'm right at 72 stitches here so let's move! 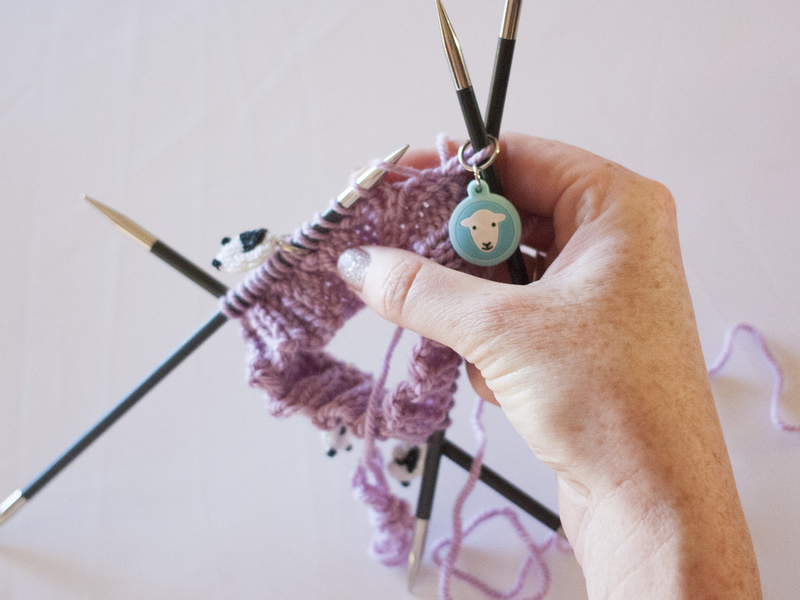 Remember, our first stitch marker was sitting one stitch in from the actual beginning of our round so slip one stitch over, remove the marker and replace the stitch back to the left needle. The pattern also calls for the 6 month size to change to Color B on this row so as I knit on to the new needle I'll also be switching to my Vanilla yarn. Here's what we have going! Moving on to circulars, changing colors, increasing, slipping markers. A lot going on but it's ok, you got this! When you make it all the way around replace your initial stitch marker right where it belongs. We made it around with our new color! Now, DO NOT cut Color A. We're going to carry it along on the inside of the sweater the entire time. Less ends to weave in! Bring Color A under your working yarn for a little half twist. As you start knitting with your working yarn it will hold the non-working yarn tight to the inside of the sweater. As you continue to work your rounds, repeat the little twist ever other round. Here's what it will start to look like on the inside. When it's time to switch back to Color A it will be right where you need it! Simply let Color B sit and pull Color A under and begin to knit with it as normal. Twists mean less tails! Keep going! Our raglan sleeves are really shaping up! The sweater is growing and the stripes are happening. I will see you again at 10 am Eastern on Tuesday for our next steps! Again, I am so sorry for the delay and now that I'm back up and running we will be back on track! Tuesday we will divide for the sleeves and begin working the body of the sweater. Keep posting pictures on Instagram and Twitter with the hashtag #EasyAsABCKAL. I love to see them! If you have a question you can ask it in the comments here or in the Ravelry group. Email me if you want, heather@eweewe.com. See the Intro, Supply List, Day 1.